In our studies, you will be able to find numerous information about cooling functionality, materials, sales figures, trends and much much more. Further analysis of cooling ceilings offers – brand image and brand insights, con-joint analysis (f.e – for association and lobbying development of sales in relation to taxes…). Together with our analysts, you will be able to gain market advantage, compare your brand performance against the market and your competitors. In need of credit ? No worries, as an ESOMAR member you can use our data to support your investment/credit lines applications towards your creditors and further expand your business. The studies are delivered to our clients in the form of pdf, pivot tables and visualized with all relevant information. Additional consulting or ad-hoc services are possible and customized to meet even the most demanding expectations from our clients. 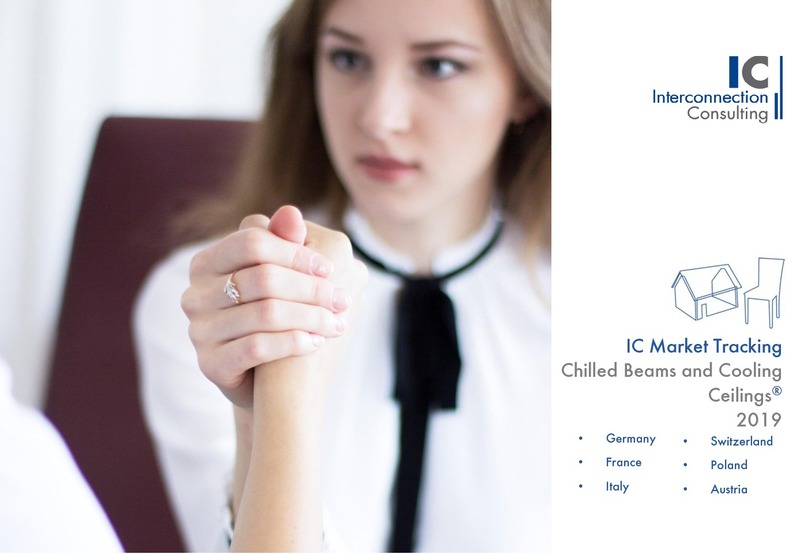 The development of the European market for ceilings with integrated cooling systems is at its best. Last year, sales rose by 4.0%, while the turnover increased by as much as 5.2%. Overall, growth in the studied countries (Germany, Italy, France, Poland, Austria, Switzerland) will increase even further, according to a new study by Interconnection Consulting. The market volume last year was 261.1 million in the six countries and is expected to rise to around 320 million Euros by 2020, an average growth of 5.7% per year. The largest market is Germany with a volume of 81.9 million Euros. 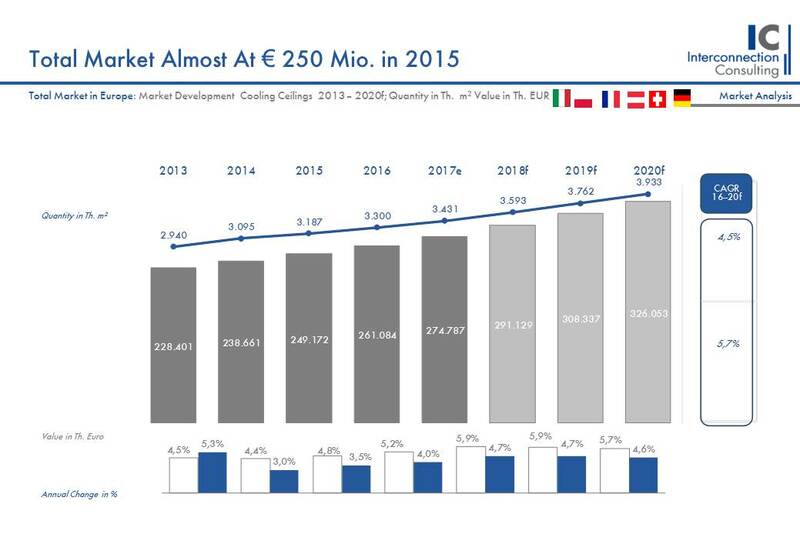 By 2020 the market volume should already reach the 100 million Euro border. The average growth in Germany will therefore amount to 5.1% in the coming years. The new building sector in particular has gained momentum as a result of the increasing construction projects in the office sector in Germany, accounting for 75.9% of total business. Growth in Austria will increase even more strongly than in Germany. Last year, the increase amounted to 5.7% and is expected to rise to 6.2% annually by 2020. The forecasts in Switzerland are even more optimistic. In the state of perpetual neutrality, the sales volume alone is predicted to grow by 6.3% in the coming years. Italy will also be able to overcome the stagnation of recent years with an average annual growth rate of 3.4% by 2020. The low-maintenance ceiling cooling systems benefit from their low operating costs compared to conventional heating and cooling systems. Combination possibilities with elements for the improvement of the room acoustics are added, explains Jan Hudak, author of the study. 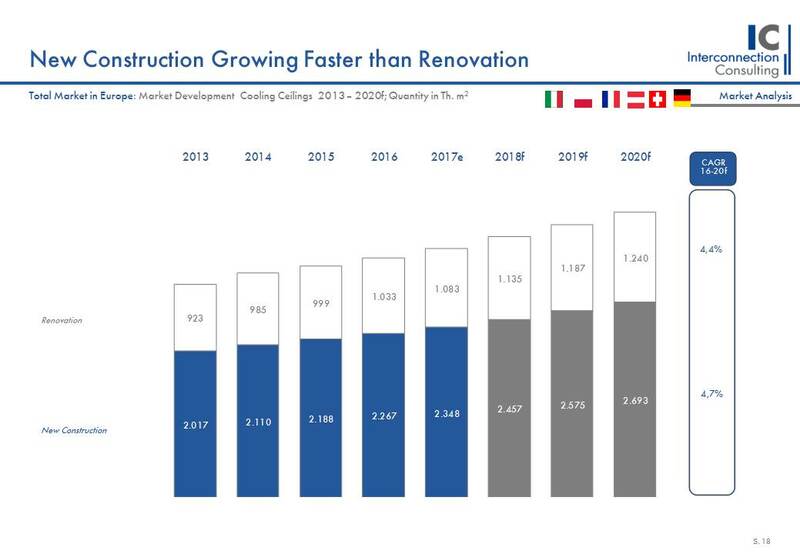 The largest product group is the metal cooling system with a market share of 61.5%, followed by plaster with 34.9%. In Germany, the proportion of metal is even higher than the European average (64.1%). However, gypsum is the material group with the strongest growth (+ 6.5% annually). In Poland and Italy, gypsum is already the most common material. The strongest application for refrigeration systems is in the office sector with a share of 71.4%. This is followed by trade (5.6%) and industry (3.6%). In all countries, the market concentration is much lower than in the individual countries, which is a sign that the market is still strongly regional. 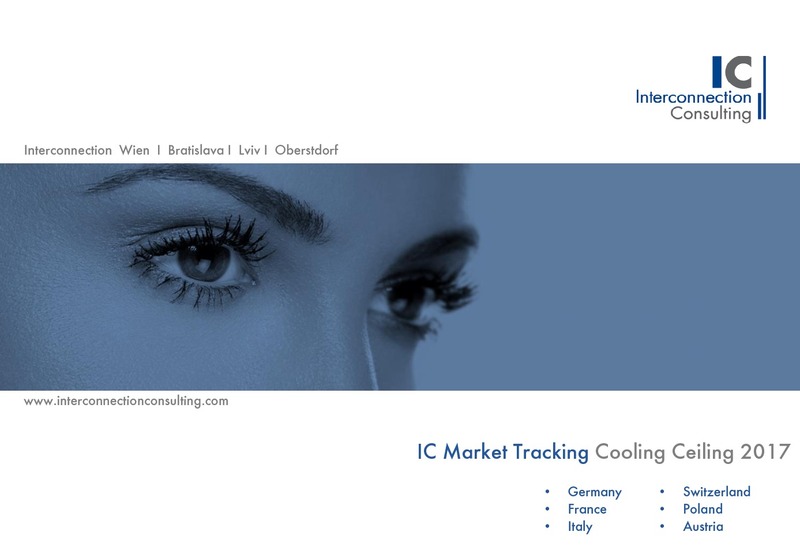 The market concentration of ceiling cooling systems is very high in the largest market in Europe (i.e. in Germany). The top 10 companies share 78.2% of the total market. The concentration in the new area (81.6%) is even stronger than in the German market as a whole. On the other hand, the market is more competitive in the renovation sector, where the top 10 companies account for about 70 percent of the market. Major companies in the industry are Aquinno, Denco Happel, Eurotherm, Messana and Uponor.